I arrived at the airport three hours before departure and headed straight to the check in area for business class passengers. I had already checked in online and just wanted to ask if I needed a lounge invitation but I was still given a boarding pass and a lounge invitation to the Swissport Executive Lounge. Aside from the Swissport Executive Lounge (above), I was also able to visit the Lufthansa Business Lounge and the Aegean Business Lounge both of which are located on the Schengen Area A of the terminal. Boarding started at 9:35pm at gate A4 with business class passengers and status holders getting priority boarding. The cabin has a total of 12 seats with a 3-3 configuration with the middle seat being blocked. On that evening flight to Larnaca, 10 of the 12 seats were occupied. As soon as all the passengers in the cabin were seated, the flight attendants started offering some drinks with a choice of wine, orange juice and water. I settled for a glass of water. Shortly after, magazines were offered and I took a copy of the International New York Times. Another flight attendant came and gave us (the business class passengers) this voucher for a free business class ticket on Aegean on the same route, that is Athens-Larnaca. She apologized for not having a separate business class on the aircraft and that they are giving these vouchers to make up for it. I remember having booked seat 5A a few days ago during the online check in and now I got 2A so there must have been an aircraft change. 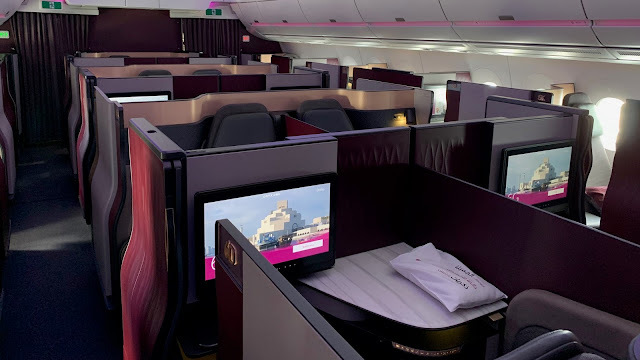 Honestly, the seats were pretty much like what other airlines are offering in business class so I didn't really think they needed to do that. Afterwards, the menu card were distributed as well. As soon as the seatbelt sign was turned off, hot towels were provided and shortly after, the meal service commenced. For my main course, I chose the fish meal which was very tasty and not dry at all. I remember asking the flight attendant for the Chios Mastiha but instead I was served a glass of red wine. I did not bother to ask for it though as I was just curious how it tasted and also, the cabin was almost full and for a short flight, it was quite difficult to serve all the guests with 100% perfection. My dessert was very good although it was a bit too much so I was just able to eat half of each. We landed at Larnaca Airport about 5 minutes ahead of schedule which was a good thing as I wanted to have enough time to go outside the airport and feel the Cyprus air! It was my first time flying on Aegean in business class and I really thought the seats were okay, as they were the same ones offered by other airlines on short haul flights. I loved the fact that there was a hot meal served on this short flight and although my drink order had a bit of a problem, I still enjoyed the flight as a whole as my fish tasted great and the crew were actually very friendly. The only thing I noticed was everybody was standing right after we landed even if the seatbelt sign was still on, and that no one from the crew asked them to sit down. I guess that's no big issue for them. To all the crew on this flight, Efharisto!